Join Us For Circus Smirkus! Tuesday and Wednesday, July 9–July 10, 2019. Four shows, 1 p.m. and 6 p.m. each day. Clown Around With CIRCUS SMIRKUS! Circus Smirkus, New England's premier traveling youth circus, is presenting an all-new show for 2019, Carnival. Come to the Big Top Tent to enjoy the lineup of spectacular and unforgettable acts, amazing acrobats, jaunty jugglers, and wondrous wire-walkers. Awe, delight, and side-splitting laughter awaits! Every summer, a freshly auditioned company of Smirkus Troupers, ages 11 to 18, takes to the road for a two-month performance tour of New England. 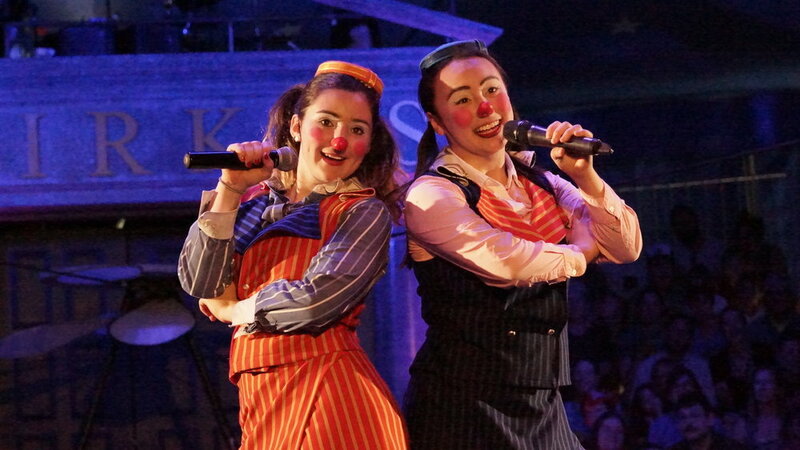 Backed by professional coaches, cooks, musicians and crew, Smirkos perform to sell-out crowds in Circus Smirkus’ very own 750-seat European-style one-ring big top tent. Smirkos endure rigorous training, daily chores, and the loading in and loading out of the Big Top. They revel in the joy of performance and the camaraderie of a common purpose—a shared dream and nearly 70 shows in just seven weeks! Group sales are available for a minimum of 15 tickets. See the Group Sales Information Sheet for more details. To apply please go to the Group Sales Signup Form. For questions, please contact jodi@northstarteens.org. North Star's presentation of Circus Smirkus will be seen by more than 3,000 people! Take advantage of this wonderful opportunity to reach a large audience, support a beloved community event, and help North Star continue to offer life-changing programs to all interested teens. ~ Learn about our sponsorship levels. ~ See last year’s program. We need several host families to accommodate at least two troupers each. It's a memorable experience getting to know the troupers, learning about life as a Smirko, and making lifelong friends! See the Homestay information sheet and last year’s Circus Smirkus Homestay Handbook to get an idea about the details. For questions, please contact Sue Surner, suesurner@gmail.com. Joining the Circus Smirkus volunteer team is a meaningful way to share the magic of Circus Smirkus with your community. Help spread the word and share the joy! Sign up for pre-show opportunities and stay tuned for signing up for volunteer shifts at the shows. For questions, please contact Jane Majkiewicz, jmajkiewicz@gmail.com. COME JOIN THE FUN! thanks for supporting north star and circus smirkus! See Where The Troupers Will BE This Year!